Often when someone is missing or losing many teeth at once in the upper jaw, a denture is made to extend to the back of the mouth near the throat. The reason for this is to give the removable denture more retention on the upper jaw (If it is not extended to the back, it might become loose and fall out). The problem, though, is that many people (in particular, people with sensitive gagging reflexes) find they can not wear this type of prosthesis comfortably. If the denture is shortened away from the throat, it will be less retentive and be looser and less stable in the mouth. The good news is that dentures are not the only solution for missing upper teeth. Dental implants will help make upper teeth more retentive with no needed coverage on the palate or extra material sitting close to the throat. Dental implants are the best solution for people with sensitive gag reflexes who are missing or will lose their upper teeth. 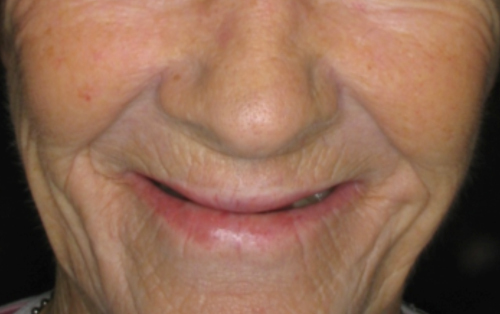 Dentures, especially for the top jaw, can be cumbersome and affect one’s speech. Because a denture is essentially a large piece of plastic that takes up space in the palate and around the tongue, speaking is affected, as the denture wearer has to speak around the prosthesis. For example, when somebody was to say their t’s and d’s, their tongue would hit their denture much sooner than they’d hit their natural palate. This is often uncomfortable and embarrassing for denture wearers, therefore dental implants are a better solution than a denture, in that dental implants prevent speech problems for those who have lost their teeth. Dental implants are placed in the jaw, taking place of your natural tooth roots, and the crowns attached to the implants can be connected and retained to each other, meaning no extra plastic would have to be placed on the palate like a denture would require, making speaking as natural as it was with your natural teeth. Dentures can drastically affect the way one eats, chews, tastes, and digests their food. Dentures render the wearer incapable of proper breakdown fo food during chewing because they are so loosely attached to the jaws, and do not allow for a strong bite force. Also, because of the additional plastic fitting over parts of the mouth, the experience of tasting and enjoying food is drastically diminished for the denture wearer. Many people who wear full dentures cannot enjoy their food and some even have severe digestive issues because they cannot effectively break down their food before they swallowing. Dental implants, however, are connected solidly to the jaw bone, so chewing and eating with dental implants is as natural as having natural teeth. Dental implants look and feel like natural teeth and allow for proper digestion, chewing, eating, and tasting food, making eating an enjoyable experience once again! Many people who wear a partial denture eventually experience the loosening of the other natural teeth remaining in the mouth. This happens because partial dentures are dentures which clip on existing teeth to stay in place in the mouth. The pressures of the denture on those existing teeth cause them to create more recession and bone loss, erode the teeth they clip onto, creating more decay, and eventually the teeth loosen from the strain of being pushed and pulled in all directions by the attached partial denture. 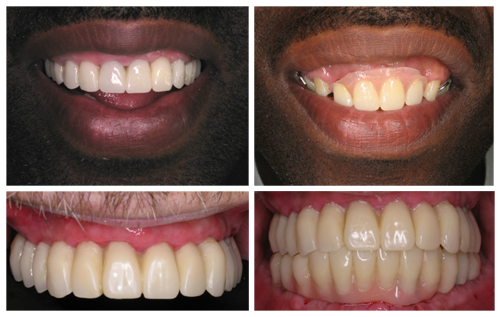 As a result, once a partial denture is worn, a domino effect takes place in the mouth, as it affects the wearers other teeth one by one, effectively causing more problems in the mouth than the wearer started with. This is a big point against partial dentures as a solution for missing teeth. On the flip side, dental implants protect remaining healthy teeth. How? 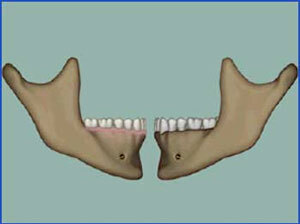 By taking the place of the roots of the missing teeth and therefore preventing bone loss in the jaw. Dental implants are a permanent solution, functioning independently like natural, healthy teeth and therefore they do not need to attach to other teeth for stability, and will not cause any further tooth loss. One of the biggest problems associated with dentures is that dentures can cause accelerated bone loss in the jaw where the teeth are missing. The pressure of the denture on the jaw bone causes it the bone to shrink, which eventually causes rapid aging symptoms such as sunken lips and cheeks and a collapsed bite, like Popeye. After about 10 years, due to the jaw shrinkage, the denture will not fit anymore and will be loose all the time, and will need to be replaced by another one, which will fit the shrunken bone tighter, but which will also continue to cause more bone loss. Dental implants do just the opposite – dental implants prevent bone loss. When an implant is placed in the jaw bone it takes the plave of the natural tooth root, which prevents its shrinking for the duration of its existence. When teeth are placed on these implants and stimulation of the implants from chewing takes place, the jaw bone is stimulated to remodel instead of shrinking and disappearing like it would with a denture. Dentures not only replace missing teeth, but they also have to appear to replace missing gum and bone tissue. The replacement teeth on the dentures do not usually look natural, and the replacement plastic gum tissue looks even less natural. Dental implants, however, allow for a natural look to the teeth. Because they need to compensate for the loss of jaw bone, and because the dentures must be a certain thickness so they don’t break, they have a tendency to be large in the mouth, taking up far more space than your natural teeth would, and making the lips look too full. In addition to how unnatural this looks, this also makes dentures uncomfortable to wear. With dental implants, the natural contour of the gums can be created and there is no extra acrylic to make the lips feel unnaturally full. 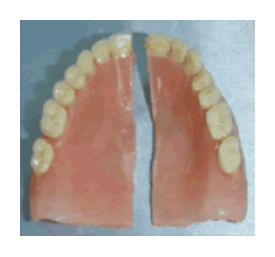 Both partial dentures and full dentures are removable, clumsy, and large. Not only do they take up a lot of space in the mouth, they have to be taken out to let the gums breathe. Imagine losing your teeth and not being able to find them or forgetting when leaving home. A replacement pair of dentures can take months to make. Dental implants are secured into your mouth so you never have to worry about leaving your teeth behind. Sometimes patients who need dentures also need additional surgery because of extra bone growth, known as “Tori”. Tori get in the way of the acrylic that is needed to create the denture, and therefore have to be removed to create a smoothe palate. In order to remove tori, sometimes a risky surgery is needed to remove them before making the denture. With implants on the other hand, no additional surgery is needed to remove tori and bony protuberances. Dentures have a notorious reputation of having poor stability. Whether it is with smiling, talking, or eating, every denture wearer has an embarrassing story about their denture coming loose. It might seem to be a funny joke to see Grandma’s or Grandpa’s teeth fall out when talking, but is not funny if you wore dentures and the joke was on you and you. Dental implants are stable. They do not come loose when you smile, talk or eat. Considering dentures have poor retention, denture adhesives are needed to keep the denture in place. Not only are the gooeyness and residue of the adhesives messy and annoying, too much of it has been shown to be harmful to the nervous system, which can result in symptoms like tremors. Dental implants never require any denture adhesive. Considering all of the factors in the options of dentures vs. dental implants, dental implants are safer and healthier. Dentures make people appear to age more quickly. With the rapid bone loss caused by wearing dentures and lack of support from teeth in the jawbone, the face will sink in causing more wrinkles to form. Dental implants allow people to have teeth permanently and as a result keep their natural bone – and their full face shape – permanently. Dentures can cause bone loss which leads to a sunken face and rapid aged appearance. Dentures can – and will – chip or break. Imagine your only teeth breaking in half and not being able to get a new one for a very long time. 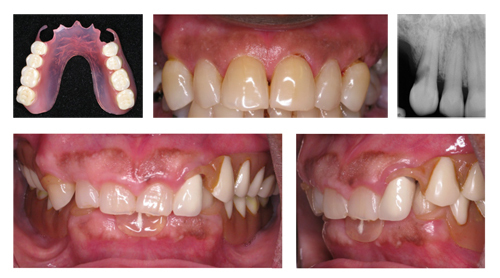 Implant bridges rarely break, and if they do, they can easily be repaired in one quick visit. Dentures are fragile and can sometimes break. Here is a healthy lower jaw. Note the height of the bone. Once teeth are lost, the bone will no longer be stimulated by the teeth roots and will begin to resorb due to disuse. 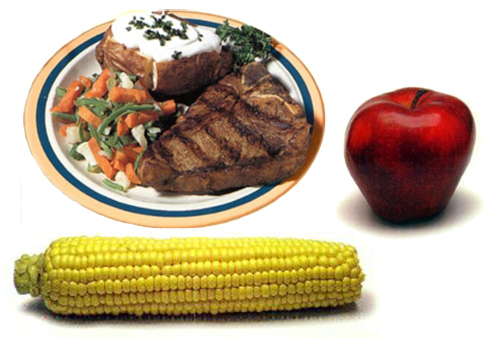 Similar to loss of muscle due to diminished use, as much as 40% of bone mass can be lost in the first 6 months. 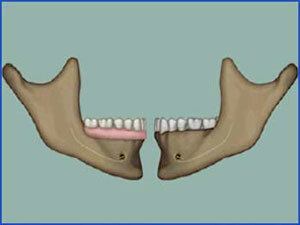 Placement of a denture replaces the teeth. However, bone loss continues, as there is no bone stimulation. The added factor of traumatic atrophy from the denture pounding the tissue and bone can cause further bone loss. 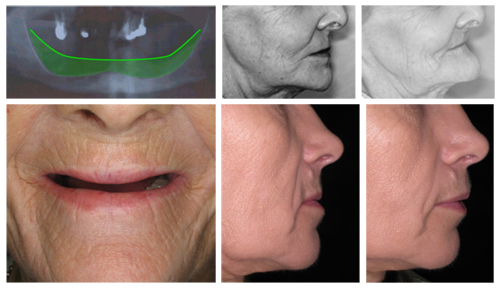 In order to maintain the same facial features, the denture tissue base must be increased in size. With more time, there will be even more bone loss. Once more, the denture base needs to be increased to compensate for the additional loss. 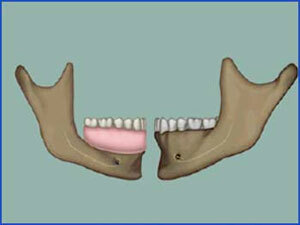 Continual readjustments and refittings of the denture don't stop jaw bone from shrinking away. 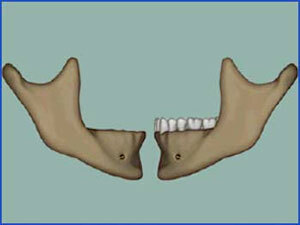 The denture becomes more and more loose (even with this compensation) as the bone continues to resorb. If you would like to prevent gum and bone loss caused by dentures, schedule a personal appointment with one of our talented dental implant surgeons today. He will carefully evaluate your bone and gum structures to determine whether you are a dental implants New York City / New Jersey candidate. If you cannot undergo the implant procedure due to insufficient bone volume, the surgeon might be able to remedy this problem by performing a bone graft treatment. In addition, all of our dentists are leading NYC / Long Island periodontists who can help you restore the health of your gums. To set up your consultation, please call us or click here.